Campbell bed and breakfast travel guide for romantic, historic and adventure b&b's. 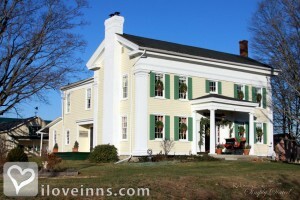 Browse through the iLoveInns.com database of Campbell, New York bed and breakfasts and country inns to find detailed listings that include room rates, special deals and area activities. You can click on the 'check rates and availability' button to contact the innkeeper. Right at Exit 41 on Route 17 in the Conhocton River Valley is the town of Campbell, named after the Reverend Robert Campbell who was one of the early prominent settlers. Campbell, New York is centrally located in the county and is northwest of Corning. Other prominent people who came from Campbell is Thomas Watson, Sr., who is the founder of the computer giant IBM. There are a lot of interesting spots to visit in this quaint peaceful town which includes Curtis, a hamlet east of Campbell Village, and Meads Creek which is a stream passing by east Campbell and Michigan Creek which is a stream entering Conhocton River via the Campbell Village. Around the area, you can stay at any Campbell bed and breakfast to further enjoy the ambiance. By Halcyon Place Bed & Breakfast.